The Kumulipo, the Hawaiian Hymn of Creation, teaches us that reef life is the foundation for all life; when we degrade our source of life, we degrade ourselves and our children’s future. Our Reef Ohana, is under assault from the aquarium trade which is allowed to take our marine life in limitless numbers and without any real regulation. They exploit some of the most important, rare and threatened species, and sell them to mainland pet stores. The reef wildlife they take are herbivores who are needed to keep our reef ecosystem healthy, clean, and vibrant. Many of the reef Ohana captured and sold are not only our food fish but our Aumakua (family Guardians) too. For example, the Lau’ipala or Lau’ikapu (common name used by Kona families), Kole (Golden eyed tang), Paku’iku’i (Achilles Tang), O’opu Hue (Puffer Fishes), Unauna (crabs and hermit crabs), baby Mano and many others denizens of the reef. All prime money-making targets for those who capture, buy and sell wildlife for the pet trade. Cruel and Inhumane treatment is unacceptable and leads to much waste! The methods of capture, storage and transport are cruel and inhumane and cause the fishes to die prematurely in the tanks, bags, boxes, trucks, air cargo holds, warehouses, and pet stores across North America. We are strongly opposed to these practices and this treatment of our marine life. Did you know a yellow tang can live for decades on a coral reef? The stress and ill-treatment of captivity causes them to die within weeks or months of capture after having barely survived in a state of slow starvation. Auwe!!! How would it be if people could get a permit to go into the forest and take as many of our native birds as they could capture, including rare, threatened or possibly endangered species? No way —right?! Our Ocean Ohana deserve maximum protections from such exploitation, pillage and plunder for profit —now! To be clear, we are for the Reef and it’s protection we are not seeking to vilify the those in the trade, we are opposed to the exploitive ‘taking’ practices that are driven by mainland corporations and pet stores and their desire to profit on our marine life at their, and our, expense. But we must remember profit is not a right in Hawai’i and the public trust doctrine specifically guards against this kind abuse and protects the people’s rights to the commons (those things we all need the water, the Ocean, air and the reefs) over any one industry’s right to exploitation and profit. The problem is the State is supposed to protect the public interest not pander to the exploitive industries. The State is not enforcing the laws that protect the public rights—Kia’i this sounds familiar right? Take Action to protect our reef Ohana now! The Hawai’i State Constitution places an affirmative duty in on the State to protect all of our rights to a clean and healthy ecosystem and environment. Also protected is our right as Kanaka Maoli (Native Hawaiians) and other members of the public to enjoy and to harvest fish to feed our families. Our ecosystem is delicate and the State’s responsibly to protect the ecosystem for the ‘betterment of the conditions of Native Hawaiians and that of the General Public’ is none negotiable. In other words, it is the states job to protect our reef systems for Hawai’i and it’s people NOT for the profit of mainland Pet store chains. Allowing the excessive exploitation by this industry is to allow profit over the great public good. Again this is a violation of the public trust of Hawai’i. In 2017 the legislature passed a compromise bill that passed nearly unanimously. The bill wasn’t perfect, but it would have phased out the trade and both sides seemed to actually support it. Still, the Governor vetoed it! Two months later, the Hawai’i Supreme Court weighed in, holding that the aquarium trade is subject to Hawai’i’s environmental laws, invalidating existing permits, and requiring environmental review before collection can continue. Here again Kia’i doesn’t this sound familiar? The failure rests with the Executive Branch—the buck stops with Governor Ige! 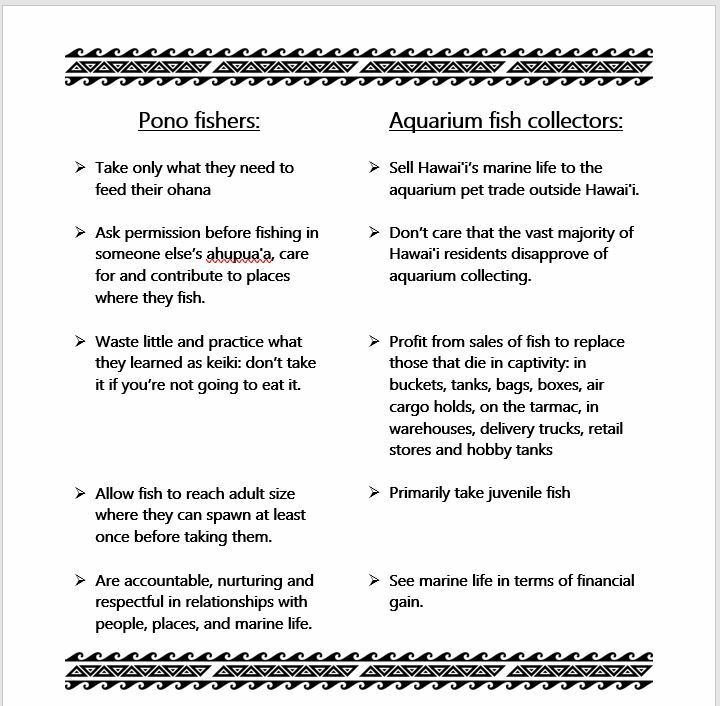 Now, thanks to the hundreds of comments submitted on the aquarium trade environmental assessments, DLNR has decided that full environmental impact studies must be conducted and that they must include a thorough analysis of the cultural impacts from the aquarium trade. And yet… our reef Ohana is still getting hammered because the governor is side-stepping the spirit and intent of the court ruling and allowing commercial collection to continue as long as the trade claims they are not using small mesh nets. Right now, the aquarium pet trade can still take as much of our marine life as it wants—and it needs to stop now!!!! There is only one solution left: a complete end to this wasteful and disrespectful trade that impacts our ability as native Hawaiians to use the ocean in traditional, cultural, and spiritual ways both today and into the future. (2) Show your support for the reef and our work Mauna to Makai by picking up a cool t-shirt, sticker and other fun things to Represent Your Reef!! !